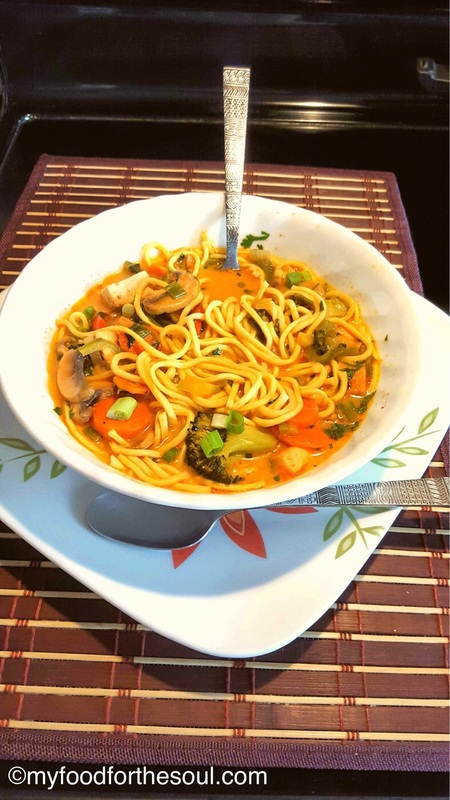 Red Thai Tom Yam Curry Noodle Soup is a combination of two very famous Thai dishes combined into one. Red Thai Curry and Tom Yam Soup basically has the same simple ingredients, but a different distinct taste. This Red Thai Tom Yam Curry Noodle Soup is flavorful, savory, tangy and spicy, but an absolute mouth-watering dish. I had previous shared a very famous Thai recipe called Red Thai Curry . Now I bring to you a combination of Red Thai curry with Tom Yam soup which also originated from Thailand and Laos. Tom Yam or Tom Yum is a Thai and Laos clear, spicy and sour soup that is boiled in a flavorful broth that is made of stock and lemongrass, kaffir lime leaves, galangal, lime juice and crushed pepper. Now let’s be honest a lot of times we don’t have all these ingredients on hand so we get turned off and decide not to make it and eat out instead. Well….no more this is a super cheat recipe, but its quick, easy, delicious and its applicable to beginners or the more experience ones. I’ve used the ready-made Red Thai Curry Paste and also the ready-made Tom Yam Soup Seasoning cube. I believe that some things are better left “to someone who actually knows what they’re doing and it ready for us”. Some days I really deep down want to make every thing from scratch like vegetable stock or the actually Red Thai Curry Paste, but honestly I’m being too lazy, completely short on time or looking for immediate gratification. This dish is exactly what I was looking for desperate gratification. In no time I had all the vegetables cut, washed and cooking up in this delightful, flavored stock. 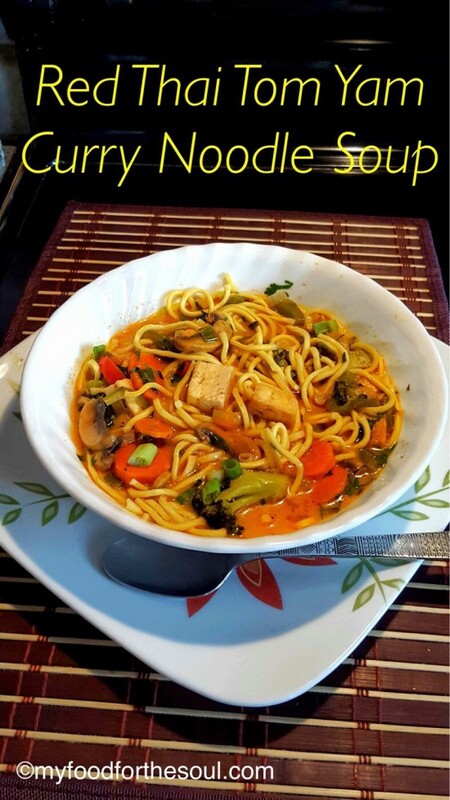 To save more time I used Instant cook flour stick (Pancit Kanton) noodles which are thin wheat noodles from the Philippines and cook instantly in hot water. Well, I hope you enjoy this dish as much as my family and I did. This is the perfect dinner idea and another great way to get your picky eaters to eat their vegetables. This dish has a perfect blend of garlic, ginger, coconut milk, spices and seasoning. If you enjoy mouth-watering fusion recipes then be sure to check out these: Red Thai Curry, Skinny Veggie Fettucine, Cheesy Veggie Rice Balls ,Broccoli Tofu Paratha and Veggie Black Bean Enchiladas. 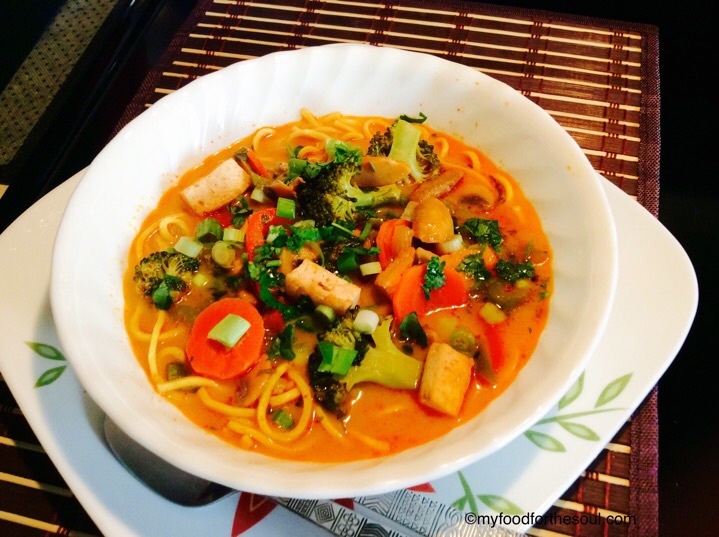 Quick and mouth-watering Red Thai Tom Yam Curry Noodle Soup. Heat 1 tbsp. of oil in a wok and shallow fry tofu cubes till golden brown. Remove onto a plate lined with paper towel and keep aside. Stir in the chopped coriander, serve in bowl and garnish with spring onions. Add in your choice of vegetables. For more spicy soup adjust Red Thai Curry Paste and Garlic Chili Paste to your liking. I love Thai food and I must say this soup is perfect, full of flavor and mouth watering!